Sadly, everything is now very overgrown, and barely recognisable. Fonthill Abbey was initially built as a mansion for William Beckford at the dawn of the 19th century, at a time when he was the richest man in England – as well as being a notoriously flamboyant homosexual – and wanted somewhere to house his immense collection of paintings, books, furniture and objets d’art. He decided to build himself a country house in the cruciform shape and style of a Gothic abbey, and commissioned James Wyatt to design and build it for him. Unfortunately, however, having designed the building, Wyatt did not pay sufficient attention to supervising its construction. The Clerk of Works admitted on his deathbed that he had not laid sufficiently strong foundations to support the weight of the tower, with the inevitable result that it fell in on itself, and demolished the West Wing. In fact, local legend has it that it collapsed – and had to be rebuilt – no fewer than seven times, but the thing that apparently dismayed Beckford more than anything else was that he was never actually present to witness these spectacular events. He encountered severe cash flow problems when he lost two of his Jamaican sugar plantations in a legal action in 1823 – just twelve years after the Abbey was completed – and decided to move to Bath. 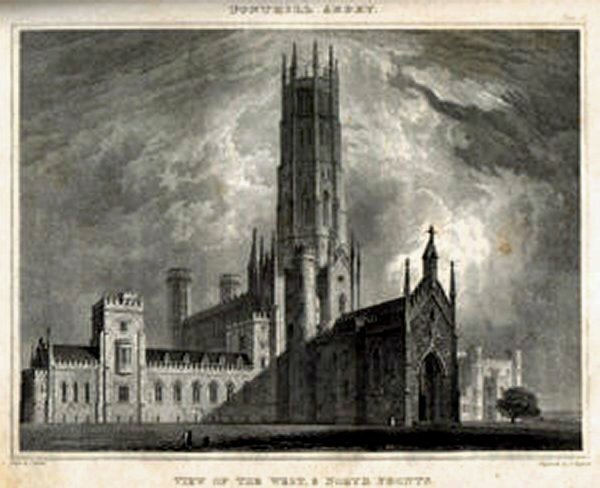 He sold the Abbey for just over £300,000, and it was then sold again to the Marquis of Westminster during the 1850s. The Marquis decided to pull down all that was left of the Abbey, apart from a small part of the North Wing, to which he added a cloister-styled extension, built from some of the original materials. This still survives today, as can be seen in Fig 2. 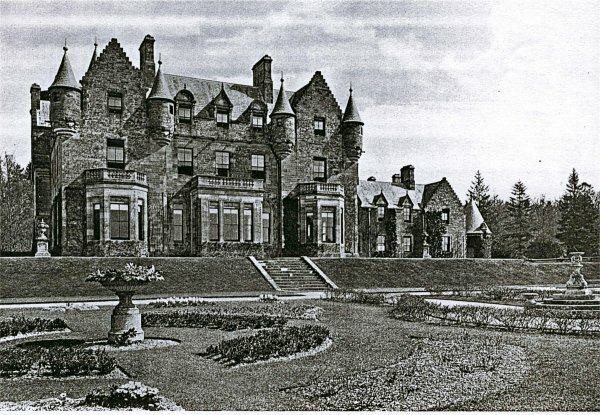 He then built another house nearby in the Scottish baronial style – probably during the mid-1850s, just before he invited James 2 to beautify the gardens and construct the rock features. Fig 3 is taken from a Country Life article dated 1901,[iii] by which time the house was owned by Sir Michael Shaw-Stewart. Whether or not the garden ornaments that can be seen in this picture came from the Pulham Manufactory is not known. They certainly look the part, although it is not possible to find an exact match in their 1925 Catalogue, and current thought is that the vases may date from William Beckford’s days, in which case they are more likely to have been brought over by him from France during one of his treasure-hunting trips. 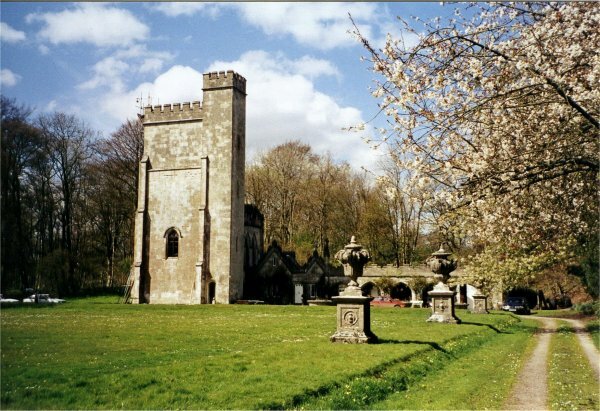 Fonthill Abbey was situated on a high plateau in the midst of a heavily wooded area, and the land on which the main part of it stood is now laid to lawn, as can be seen from Fig 2. Following the path down to the south, past the point from which this picture was taken, one arrives to the edge of a precipitous drop into a steep valley, and it is at the top of this that James placed the cliff to which he refers in his notes. It is now in a very sorry state, and it is not possible to inspect it in any detail. 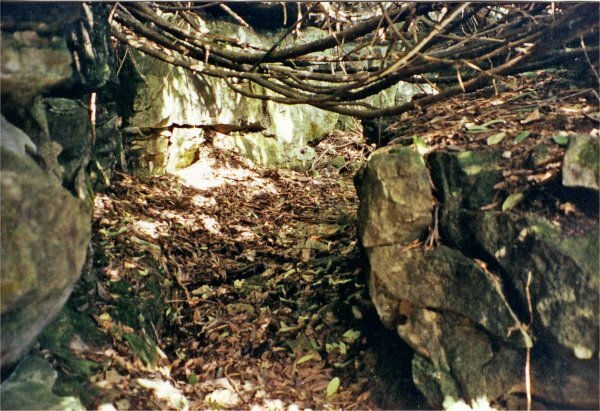 Trees have fallen across it, or damaged it over the years, and it is only possible to climb down a few feet and aim the camera – the result of which can be seen in Fig 4. About halfway down the slope into the valley there is a small lake with an island, and the rest of the Pulham rockwork is down there, on the other side of the lake from the house. To reach it involves a very bumpy ride, but one eventually comes to a point on the opposite side of the lake from the cliff, where an outflow is fed under the path and down into a steep gully which leads down to the bottom of the valley. In days gone by, the water flow was used to power a sawmill, but this is now completely tumbledown and derelict. 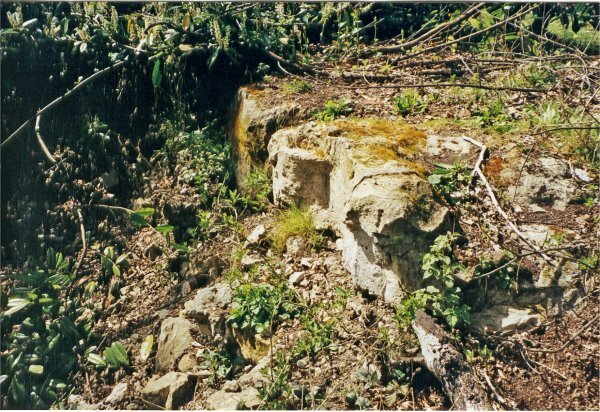 It would have been at the top of this gully – where the water was fed from the lake, that James 2 constructed his ‘waterfalls in a rocky stream,’ but the ground is now in no condition to encourage the visitor to climb down and inspect what remains of this work. A pump was recently discovered, buried near the bottom of this gully, and it turned out that the firm – Green and Carter, of Taunton – had supplied pumps for several other Pulham installations. In fact, this firm could have taught James Pulham and Son a few lessons in the art of keeping company records, because their business goes back more than two hundred years, and they are able to trace records back to all their customers and installations since their earliest days. In his case, they were able to confirm that the pump at Fonthill was installed c1860. Sadly, it is most unlikely that the water will ever cascade down this hill again, and, even if it did, there would certainly be a whole lot of work necessary on the sawmill before that could also be brought back to life. From a point near the spot where this picture was taken one would have had to look across the lake to see the Marquis of Westminster’s new house, so the most likely explanation seems to be that the visitor would be invited to take a quiet stroll around the east end of the lake, and walk through the ‘rocky path’ towards the point where the water cascaded down to the sawmill. From here, they would presumably have been able to look across the ‘pond,’ and past the ‘island,’ to see the house standing atop the man-made cliffs on the opposite bank. As for the ‘pond’ and ‘island’ themselves, I expected to find some evidence of rockwork in places around the banks, but found none. That is not to say that there is none there, though, because the whole site is now in such a sorry state of repair that it is impossible to be sure. The house is no longer there either. As indicated above, Sir Michael Shaw-Stewart purchased the Marquis’s estate sometime before 1901, when the article appeared in Country Life. His family then had to leave when the house was requisitioned by the Army in 1941 – and they blew it up when they left soon after the War . . .
[ii] Various internet websites, including http://en.wikipedia.org. [iii] ‘Fonthill Abbey, Wilts’ from the ‘Country Homes and Gardens, Old and New’ series, published in Country Life 28th December 1901. Posted on March 1, 2013 June 4, 2016 by Claude HitchingPosted in Sites Month 2Tagged . . James Pulham and Son, cliff, Fonthill Abbey, Green and Carter pump, James Wyatt, lake, Marquess of Westminster, William Beckford.